-Red hair (obvi) Everyone comments on it. I still can't believe I have a red-head! -She is a jolly little lady. Rarely cries and is just so content and pleasant. -Is completely enamoured with her older brother. In her eyes, he can do no wrong. She giggles the day away watching his every move. -Loves the Johnny Jumper as much as her sister did. She is so darn delicate and graceful when she jumps. It's pretty amazing the way she points her toes and does a perfect first position. -She is still a tiny little peanut. Almost 8 months old and wearing size 3 months. She's still in a size 1 diaper--which is nice...makes our dollars stretch a little further in the diaper department since you get more bag for your buck with the smaller sized diapers. -Is grabbing everything in sight within her reach. -She looks great in bright pink. Just sayin. -She fusses around 5:30 a.m. every single day--but the little lady doesn't get the goods from mama until after 7. She always goes back to sleep and wakes up happy then. -Isn't much of a roller (none of my kids have been). But sits and jumps like a champ. -My favorite thing about her is her smile. Such a HUGE and bright and glorious smile. 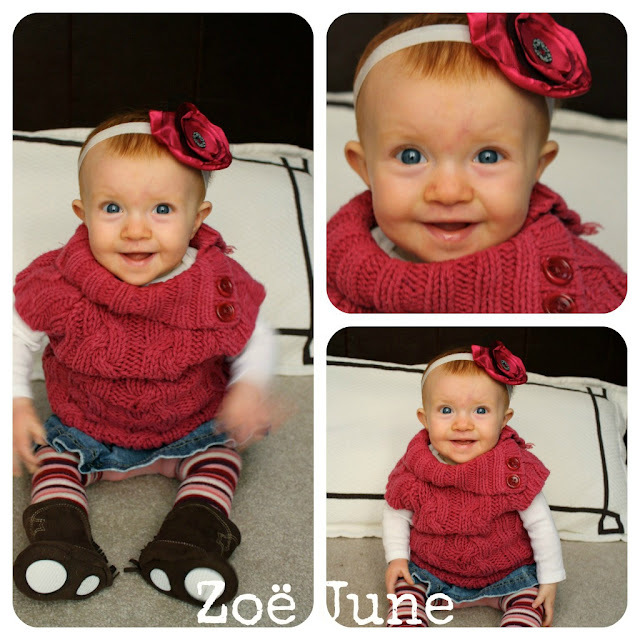 Most of all, there has been something about Zoë that has brought our family together in a unique way. She has made us feel so complete. She has brought so much peace. Its like she removed a huge stumbling block in my heart and soul and has made it much easier to breathe. I can't get enough of her. Can I get her sweater in my size, please? Seriosly, she is so sweet and cute! Your love for her is most precious! I am happy for you! What a doll. SERIOUSLY. You two make the most beautiful babies. ALSO? Having a redhead is so much fun--lots of extra attention. I love this post. Made me smile. Can't wait to meet this Miss Z! Every time you post a picture of little miss Zoe, I get this big grin on my face! She has a way of making everyone happy! She is a beautiful little girl, full of a very special love. I think its wonderful she is staying little, babies are just to much fun to snuggle and love on. oh-h-h-h, I am way wanting to cuddle her littleness, up close, and for as long as she'll allow. Send her to Russia UPS. Can't wait!! Z is SO darling. Can hardly stand it. Thankyou for sharing your feelings of happiness and contentment. that made me so happy, too! ( both the posts!) Have a good week, Miss Molly! Love you!